Now we get to the fun part the actual turning, one question I get asked a lot is what size of tools do I need to turn pens. Well you can go out and spend a lot of money on one of the pen turning sets but you don’t need to I use ordinary tools. A roughing gouge, 3/8” spindle gouge, 1” skew chisel and 1/2” skew chisel. 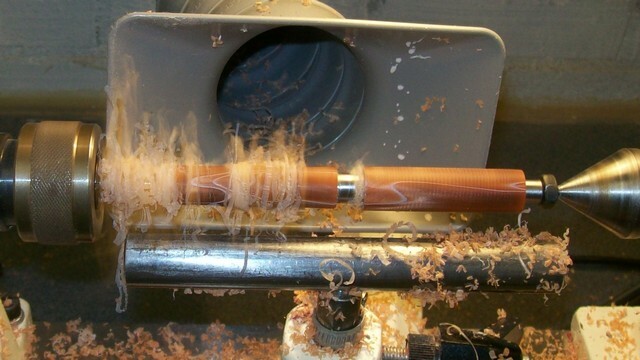 The other thing you need is a way of holding the blanks on the lathe, my preferred method is a pen turning mandrel but there are other ways especially if you just want to turn one pen. You can make yourself a wooden jam chuck to fit inside the tube at the headstock end and use a live centre in the tailstock. You could also turn the same in brass or if you know someone with a metal lathe get them to turn you a metal jam chuck. My preferred method is using a pen mandrel with bushings to suit the pen you are turning. 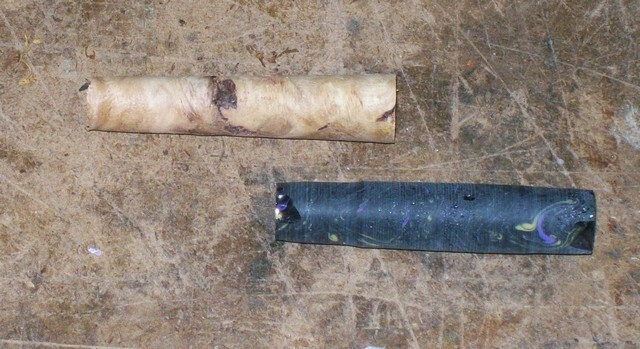 Now put the mandrel in the lathe and the blanks on the mandrel with the bushings dividing them. 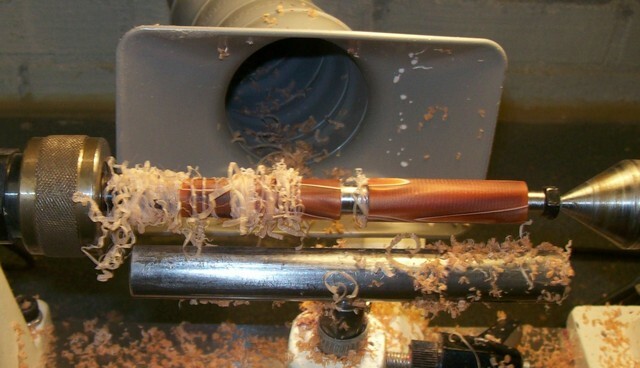 The blanks should just slide onto the mandrel If they don’t use a small fine file or rolled up sandpaper and gently clean the burr of the inside of the tube ends. I always mount the top to the headstock end as I find this the easiest way to work. When the blanks and bushings are in place put the nut on but don’t tighten it yet. Put the tailstock in place and lightly tighten it up then lock it off, the idea is the tailstock supports the end of the mandrel and keeps it running true. If you over tighten the tailstock this can bow the mandrel which will result in an out of round pen. Once it is in place tighten the nut on the mandrel by hand. Always use sharp tools and light cuts. If you stop the blank turning you are either taking too heavy cuts or your tools need sharpening. Do not hit the bushings with your tools as this will blunt the tools and alter the size of the bushings. Always leave the blank slightly larger than the bushings to allow for sanding. One of the problems with turning acrylics is that the shavings have a habit of wrapping themselves around the mandrel and the blank. This gets in the way so needs to be removed regularly the best way to do this is to stop the lathe and pull it off. At times things do go wrong as shown in the picture below, the wooden one is a result of a fault in the wood which I didn’t see until the bit flew out and disappeared and the acrylic was me not paying attention and taking too heavier a cut, twice I think looking at it.